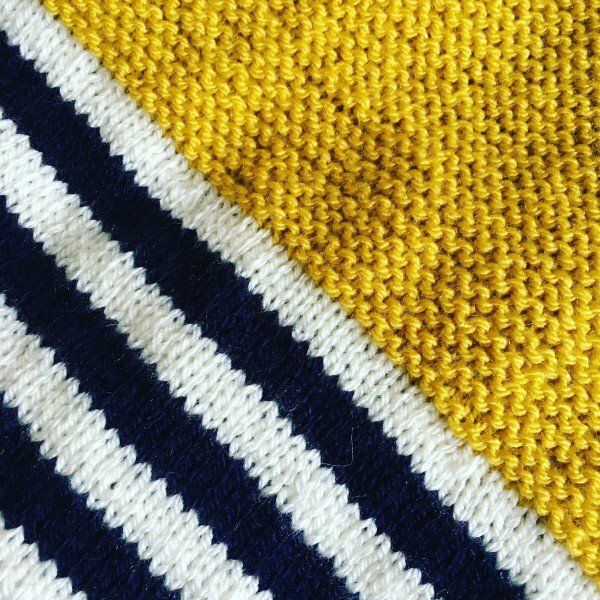 By any sort of measure, I should not have made my new Cornwallis Jumper. Firstly – yellow is a very difficult colour to wear, anybody will tell you that. Think about it, apart from the glorious Seasalt Jacket that revived our love for Souwester-chic, you won’t see many people sporting sunshine yellow. Mustard, now mustard is a different thing. It is on the very edge of chic, but is worn by the brave and the knowing, along with orange and fuchsia. Secondly I have had plenty to do on the crochet front that it was almost irresponsible to start another project. At the very least, naughty. Finally – stripes. 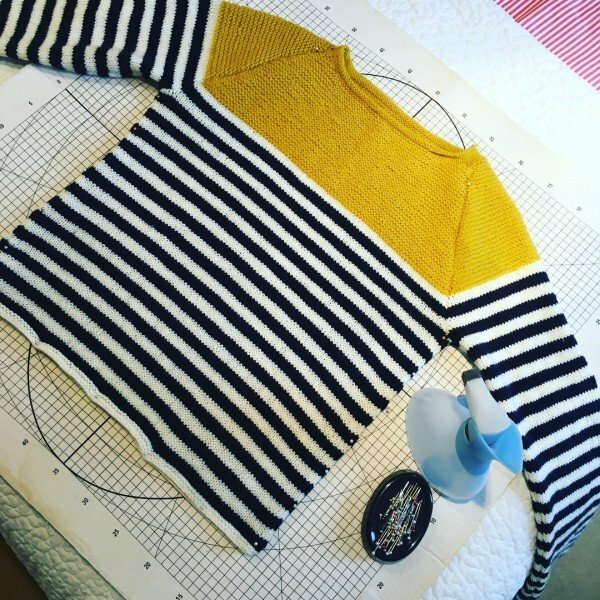 If you know me at all, you know I love a Breton Stripe. I always have. 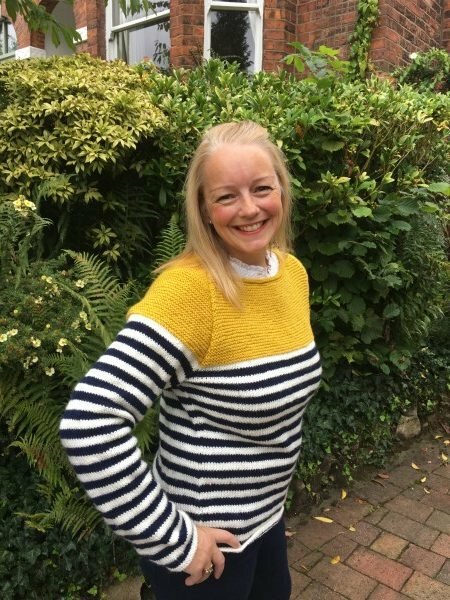 I have had Breton stripe t-shirts in my wardrobe when the only place to get them was…. Brittany. Way before the high-street shops made them wonderfully accessible. But you know what? I know I really shouldn’t wear stripes. Or if I do, I know that I need to be a bit careful. Let’s not be too coy, a slightly lumpy lady can look even more ‘bumpy’ in a horizontal stripe. I know this fact and flagrantly disregard it. So there was incredible sense of inevitability about this pattern. I knew that one day I just had to make it. Like a bar of your favourite chocolate sitting in the fridge. You try to be ‘good’ but then one day you succumb and devour in one sitting. 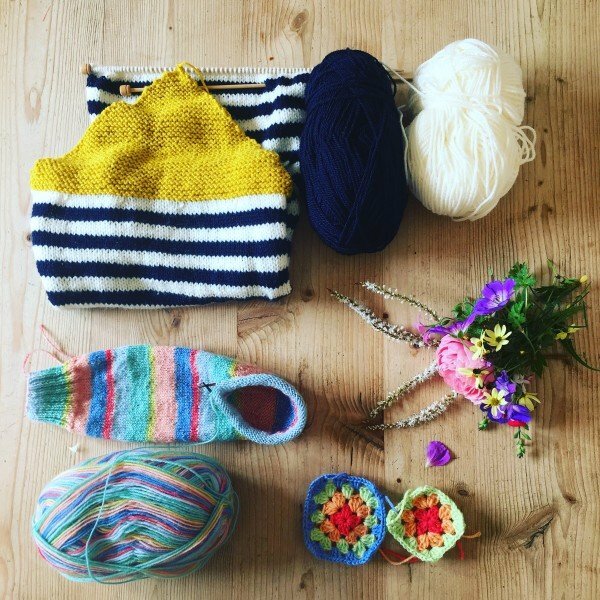 If you knit or crochet, you might be aware of the hypnotic power of the ‘must-do’ project. An idea takes hold and you ‘must’ cast on and begin. 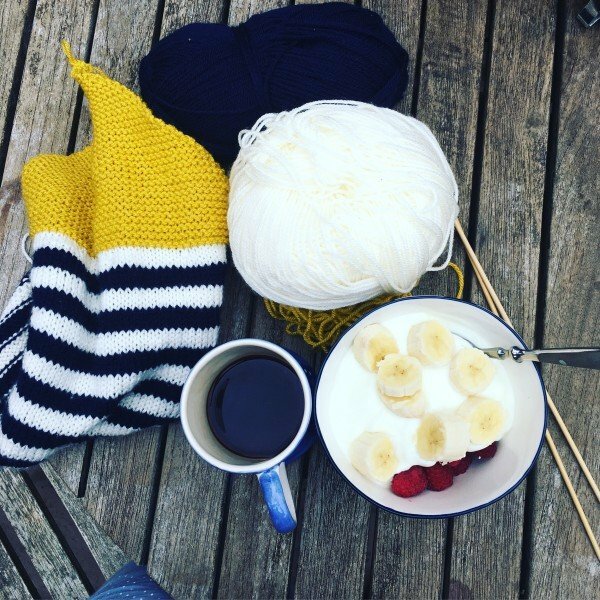 I don’t sleep walk, but it has occurred to me recently – do I sleep knit? 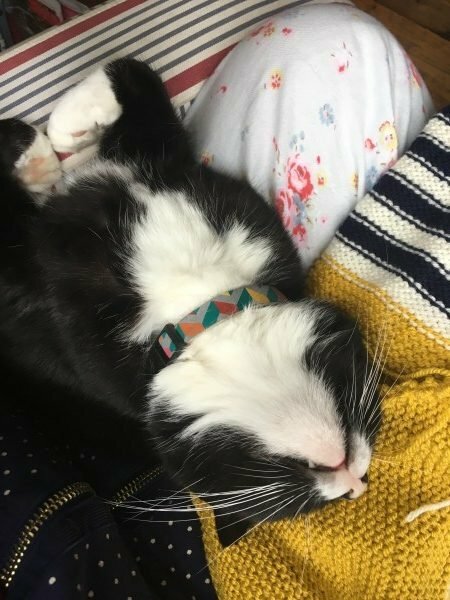 I had all the yarn I needed for this project in my stash. The pattern was designed few years ago by Martin Storey for Rowan. The pattern has featured in Rowan’s 40th anniversary magazine. 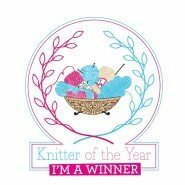 I don’t remember what time of day it was, or what I should have been doing instead of mucking about with yarn. But before I knew it the stitches for the back were cast on. I had the yarn in my stash, Stylecraft Special DK. If you are interested I have used Cream, Navy and Mustard. I chose to work 4 rows of garter stitch at the hem-edge and cuffs to try and avoid the inevitable roll of stocking stitch hems. It hasn’t totally worked, but I don’t regret my choice. 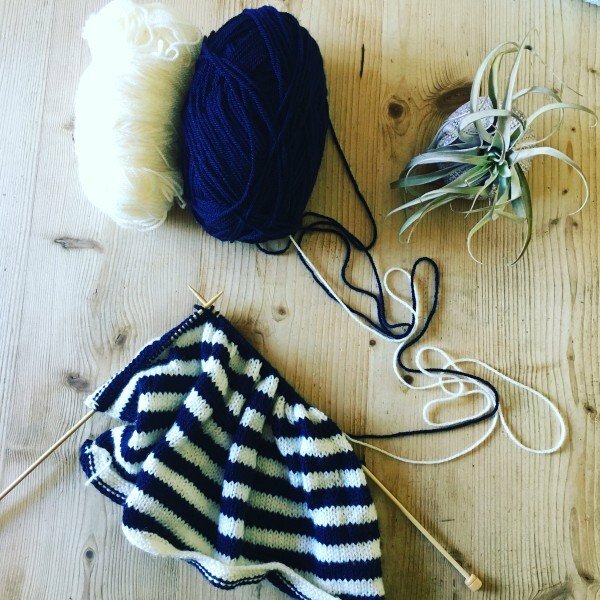 You might believe that stripes would be boring to knit. I actually find the reverse. Pattern knitting can via between ‘challenging’ needing ultimate concentration, or be rather encouraging. Unlike a plain knit, you can see that you are making progress. A stripe marks the gradual growth of the project and has a mindful repetition. You can hear your self thinking…’just two more rows’. In all, interspersed with other projects, the jumper took me about 3 weeks to complete. The sewing up can always be a bit of a concern. A sweater can be ruined in these last details. A lazy alignment of seams can take you from success to woolly mess. Perhaps due to my ‘fashion fast’, I was keen that the finished looked as good as possible. I blocked it twice. Once before the joining of seams and then again when I had knitted the neckline. Am I pleased with it? Will I wear it? Yes I think so. This is not a random or ridiculous question. 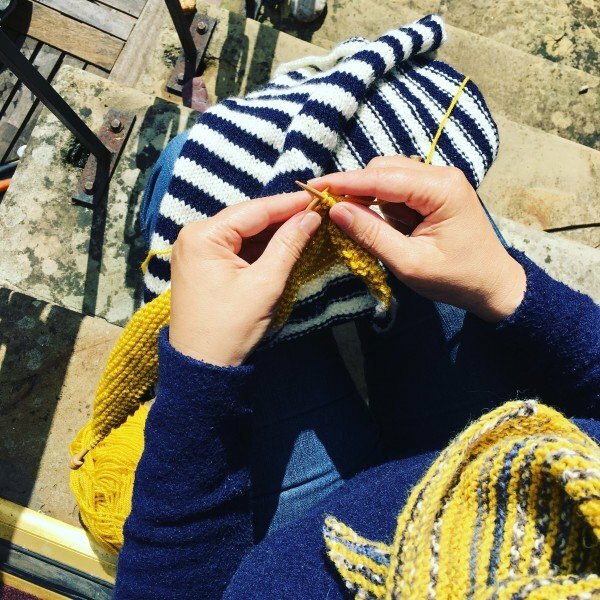 Many makers will tell you that even though they spend hours making an item of clothing it is with GREAT trepidation that they finally wear it and look in the mirror for the great judgment – has it worked? I am frustrated that the arms are a little too long. Has it taken me all these years to realise that I have short arms? It is rather jaunty and I do like the texture jump at the yoke from stocking stitch to garter stitch. I did wear it last Sunday and I might wear it again today. As the days grow colder here I feel that I will benefit from an additional snuggly item. Bouncing into Autumn, I am not sure I will have time to add to my ‘homemade’ wardrobe before my self-imposed fashion fast is over. The Cornwallis might tide me over into Winter and there is still plenty of old winter clothes I can discover to ring the changes. I am so glad that inevitable jumper became a reality. Make when you can – wear with pride – and just occasionally try to wear a colour you would never normally wear. You might be surprised. Really nice jumper. I like the combination of colour.